Description: Hello all Monster High cartoon fans! 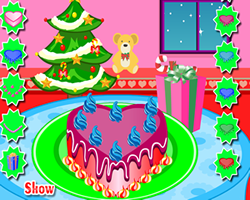 Today you can have a lot of fun in a new cake cooking game, Clawdeen here is going to show you how to prepare one delicious epic chocolate pie. You will find all the ingredients you need on the table, you just have to follow Clawdeen's instructions and combine them, bake the mixture, let it in the fridge for a while and than finally decorate it, after all this our chocolate pie will be ready to be served.